Under an on-bill financing program, utilities can loan money to customers to make any number of energy efficiency improvements. The customer would then pay off the low-interest loan through an additional line item on their utility bill. House Bill 374 was approved by the Alaska House of Representatives in early April by a vote of 36-2. 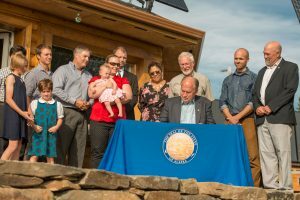 The Alaska State Senate unanimously passed the bill on May 12, the final day of the Second Session of the 30th Alaska State Legislature. Alaska Governor Bill Walker signed HB 374 into law this evening during a bill signing ceremony in Fairbanks. For more information, please contact Laura Stidolph in Rep. Wool’s office at (907) 452-6084.